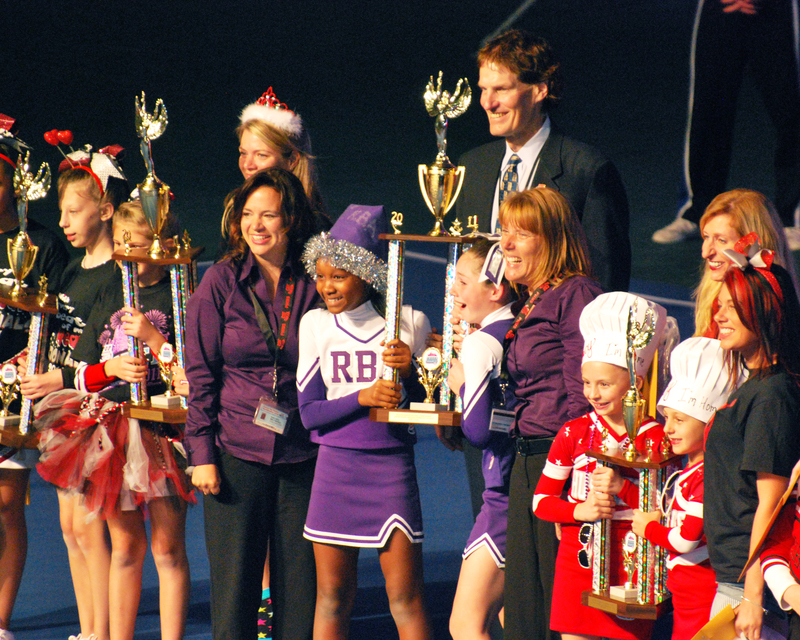 (Left to Right) RBA Cheer head coach and coordinator Jean Lafave, cheerleaders Alyssa Godby, Kiniah Deschamps, assistant coach Cathi Mintz and John Butler, president of Pop Warner Little Scholars holds the National Championship trophy for the Junior Pee Wee Medium Intermediate Division. MUST SEE video of the Jr. Pee Wee National Championship Performance! Unbelievable routine and stunts for 9, 10 and 11 year old girls! The Roger Bacon Academy cheer squad wins national championship in Orlando Florida! 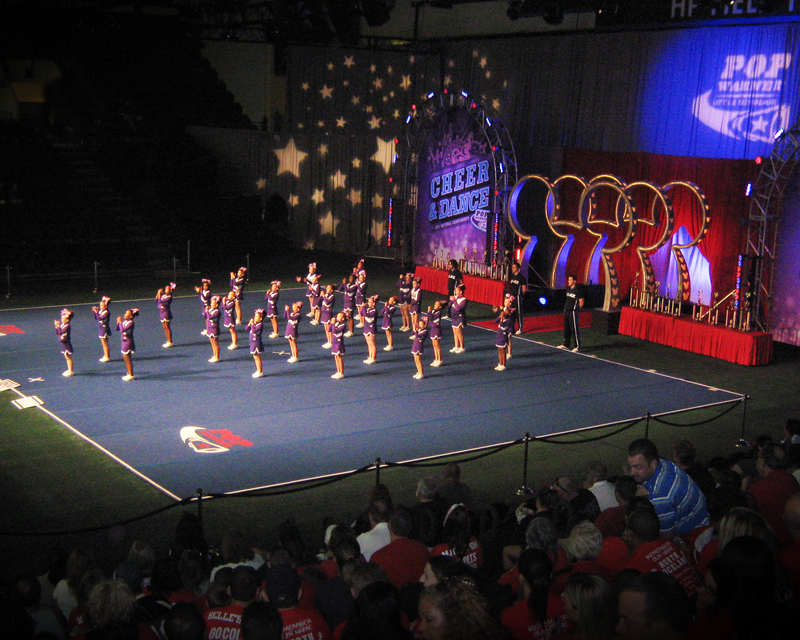 ORLANDO, FLORIDA: December 10, 2011 – Precise movements, school spirit, contagious enthusiasm, vocal articulation, spiraling jumps, unbelievable stunts, team pyramids, individual safety and crowd appeal are all part of what is intensely scrutinized by five national Pop Warner cheerleading judges. The cheerleading teams only get one shot to show their stuff. 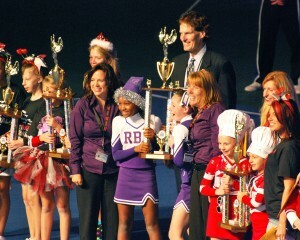 One shot was all that was needed for The Roger Bacon Academy’s Junior Pee Wee medium intermediate cheer squad to take home the national championship on Monday, December 5, 2011. They not only received the highest award, the squad which is composed of 9, 10 and 11 year old girls but were also awarded the “Spirit of Sport Award” for sportsmanship. “I am so unbelievably proud of our cheer squad for this monumental accomplishment of winning the national championship!” said Jean LaFave Pop Warner cheerleading coach and coordinator for The Roger Bacon Academy. “And I am equally as thrilled with them winning the sportsmanship award. It’s the best of both worlds to compete well and do it with a great attitude,” she added. 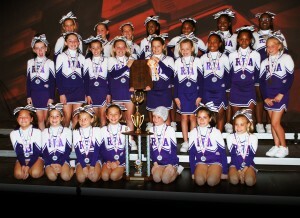 RBA Junior Pee Wee Medium Intermediate cheer squad pose with the National Championship trophy. Other RBA cheer squads competed at the National tournament this week: the Junior Pee Wee large intermediate cheer squad placed 4th in the nation and the Midget cheerleaders place 6th in the nation. The 2011 Pop Warner National Cheer & Dance Championships took place Saturday, December 3rd through Saturday, December 10th at ESPN Wide World of Sports™ Complex located at Disney World in Orlando, FL. “These girls left everything they had on the mat,” said Cathi Mintz mother of cheerleader Abby Mintz and assistant coach for the championship cheerleading team. “It’s all about heart when you’re competing on this level and they were able to handle all the pressure, keep their wits about them and perform a near flawless routine,” she said. There will be a campus wide celebration for the cheerleaders on Friday, December 16th at 11 a.m. The event is open to the public. RBA Junior Pee Wee large intermediate cheer squad competes on stage at Disney World in Orlando FL. The squad took home fourth in the nation. The RBA Vikings Cheerleading Squad consists of over 120 current and former students from the Charter Day School ages 5-15. The purpose of cheerleading is to follow the school pledge, promote school spirit, support our teams, foster good sportsmanship, and encourage the competitive spirit. The coaches strive to develop the student’s personal development of poise and self-confidence. Cheerleading was officially recognized in the 1970’s, but has been a part of the Pop Warner program for several decades. The first ever National Cheerleading competition was held in DeKalb County, GA. Today, more than 180,000 children are participating in Pop Warner cheerleading and dance around the world. Participation in the Pop Warner Spirit Program provides kids an opportunity to perform in an organized, supervised, safety-oriented environment. Pop Warner programs emphasize fun for all and encourage the development of qualities important long after Pop Warner days are gone.